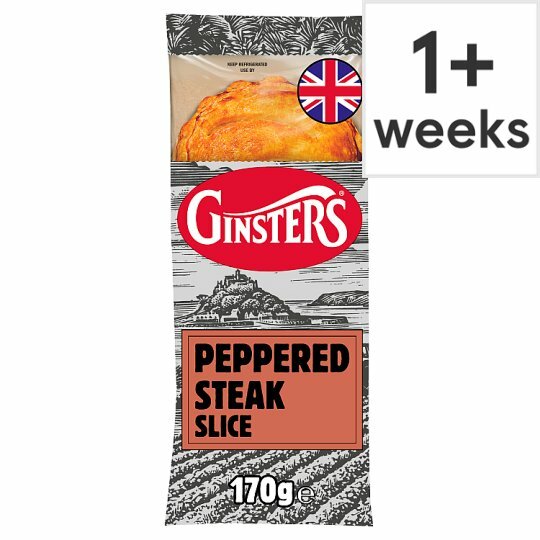 British steak with potato and onion, cooked in a distinctive creamy pepper sauce with a hint of mustard, wrapped in light puff pastry. Keep refrigerated, Suitable for home freezing, Freeze before use by date, Consume within 1 month, To eat cold, defrost thoroughly and consume within 24 hours., Do not refreeze. Cooking Instructions (General): Heating Guidelines: Remove all packaging. For best results oven bake. Microwave (From Chilled): Heat on full power for 1 min 30 secs (800W). Leave to stand for 1 min. Oven cook (From Frozen): 1 Pre-heat oven 180°C, Fan 160°C, Gas 4. Oven cook (From Chilled): 1 Pre-heat oven 180°C, Fan 160°C, Gas 4.